This is probably not the Target you’re looking for. 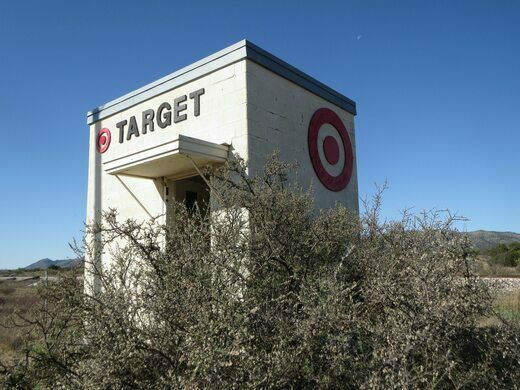 At some point in 2016, persons unknown adorned a tiny cinderblock shack along US 90 with the big-box chain Target’s lettering and bullseye logo. Located about 15 miles outside Marathon (pop. 430) in Brewster County, Texas, the shack is now unofficially known as the Target Marathon. The raison d’être of the Target Marathon remains unclear. It was perhaps inspired by the Prada Marfa, an art project in the West Texas desert. 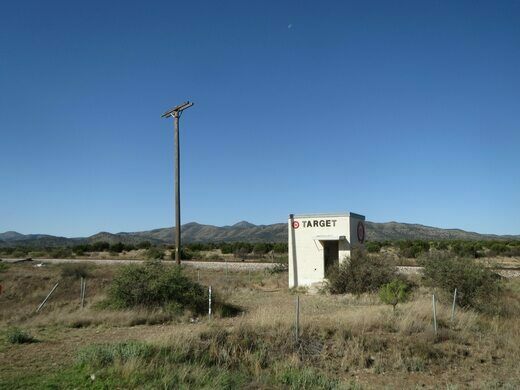 Unlike the Prada Marfa, however, no one has ever claimed to have created the Target Marathon. Both “stores” are non-operational, although the Prada Marfa does at least contain some Prada merchandise. The tiny Target contains absolutely nothing, save for some sand and an occasional desert creature sheltering from the midday sun. So if you’re trundling along US 90 and spot the bullseye up ahead, don’t get all excited about discount goods. 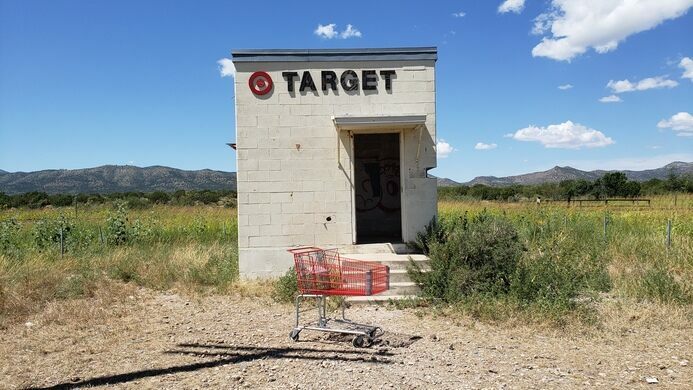 But if you appreciate unusual art installations, if that’s what you can call the Target Marathon, then pull over and have a look. Don’t delay, however, or it might not be there at all. As no one has claimed ownership of the Target Marathon, and it could conceivably be stripped, knocked down or otherwise altered at any time. The Target Marathon is located about 15 miles west of Marathon on the way to Alpine. You’ll see it on the south side of the US 90 alongside some railroad tracks. Entrance is free for humans, rattlesnakes and all other desert dwellers. Target REDcards are not accepted. ‘a creative project is a moving target.